EQUIPMENT WORKS, INC. takes tremendous pride in the work we perform on heavy and medium duty vehicles. Using the latest technology, we can diagnose and repair problems with drivetrain components including engines, transmissions, brake systems, suspension systems, etc. 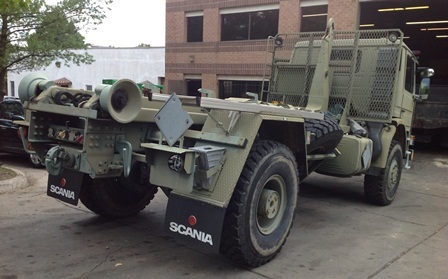 as well as make repairs to the equipment installed on the vehicle, whether it's a refuse body, truck crane, Bobcat loader, or a one-of-a-kind military type vehicle. Our on-staff ASE Certified Master Heavy and Medium Truck Mechanics undergo factory and aftermarket training courses necessary to keep up with constantly changing vehicle specifications. We have "hydraulic experts" that can tackle complicated jobs. Whether your have one or a fleet of Fords, Macks, Isuzus, Hinos, Internationals, GMs, Peterbilts, Kenworths, ETC we offer many of the same services as your truck dealership -- without the high dealership labor rates.